to find your bear fast. We have a total of 5 Alice's Bear Shop subcategories for you below. Scroll down to take a look, clicking each image will take you through to view the products in that section. Rikey Austin first created the stories and characters of Alice's Bear Shop over 20 years ago and she tells the stories of the bears and how they made their way to Alice's Bear Shop. At the time they were hugely popular, both as cuddly companions and stories to read but unfortunately, due to circumstances out of Rikey's control, the production of this amazing range ceased. After a chance meeting between Rikey Austin and Charlotte Morris of Charlie Bears, these two creative and imaginative women decided to join forces and bring back the magic of Alice's Bear Shop!! This is a great collaboration, combining Rikey's talent for designing and illustrating and Charlie Bears experience of manufacturing, quality, safety and ethics. Rikey is still the creative force behind the range and so after 2 years of planning, Alice's Bear Shop will make it's welcome return in October 2018, with all of the original characters, including Woodroffe, Cobby, Sandy, Captain, Tat and Little Lost Bear. As well as the storybooks, there are also additional sets of clothing, Art Prints, and Pin Badges, with further characters to follow……………so are you ready to open the doors of Alice's Bear Shop and join in the fun of this magical world?? 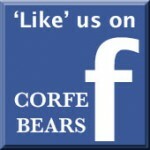 This website is Copyright © Corfe Bears and protected under UK and international law.